It’s been a little over a month since we last updated everyone on what’s been happening here for us in the UK. It’s been a completely life-changing and perspective shifting experience for us, and it’s a challenge to really capture everything. That said, we don’t want to leave anyone in the dark, and we definitely want people to share in our experience and learn from it. Who knows, maybe you’re next to step out into the unknown and see what God does! With all that in mind, I thought I’d share a few experiences and thoughts from the time spent here thus far. Again, you won’t get the whole picture, but at least you’ll be able to catch a glimpse of what it’s been like for us to be here. 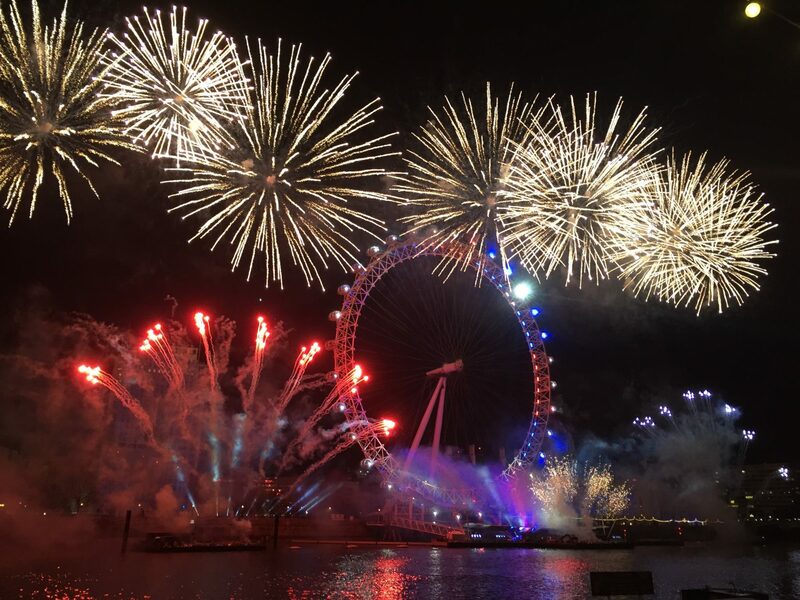 Side note…the image from this post was taken at NYE in London. Remind us to tell you the story of how we ended up with the most amazing spot to watch the fireworks. Fun times. We’ve mentioned the idea of reinvention a few times in a few posts already here, but it bears repeating – Yvette in I are in an unbelievable state of renewing, refreshing, and revitalizing our life. I think anytime you step out in faith, you invite God to do a work in you that you don’t expect. That’s exactly what’s happened. In an almost tangible way, there is a spirit of hope and pressing on that I’m not sure I’ve experienced before in my life. We want this time to be more of a reset button than a pause button. The phrase “reset, not pause” has come up several times in our home over the last few months. Forgive the video game metaphor, but there is this real sense that we want life to be something new on the other side of this journey. What we don’t want is the temptations to fall back in and coast into our life as it existed before to take hold of us and make this experience for naught. Surely there are perspectives we’ve gained and experiences we’ll cherish always (not to mention the AMAZING people we’ve met), but if we don’t come out of this changed for the better, we’ll have to ask ourselves what’s the real point of it? I feel confident that as the tires touch down in DFW at the end of February, we’ll step off the plane different people. Something I feel we’ve completely blown it on while we’ve been here, is really sharing what’s been going on in the local church here, and how it’s impacting the way we view Church, missions, and the cause of Christ worldwide. It’s been really easy to share the day-trips we’ve taken to Brighton, Stonehenge, Bath, or Oxford – because we can capture those quickly in smiles and photographs for you to consume with us. What’s been more difficult to explain is the radical shift in our mindsets regarding church and its impact on the culture around us. While there may be ways to do church right, or do church wrong, I really don’t know what those things are – and when you’re using the tools you’ve been given to glorify God and to do good in the community around you, hopefully we can let go of the semantics. Being a part of the church culture has increased our awareness of God on a personal level, simply by removing the “us and them” mentality and reinforcing the idea that we are all a part of the “us”. Maybe that doesn’t sound very practical, but it’s a life changing concept if you’ll allow it to be. Full disclosure, the holiday season was particularly difficult for us in the homesickness department. Despite becoming more involved and more connected to our friends and church family here, we became increasingly aware of the distance between us and most of the world that we know. This is a difficult passage to write, because there’s a sensitivity we want to show to the people here that have been so incredibly gracious to us, and have welcomed us into their homes and families like we never fully expected they would. We truly feel that in the short time we’ve been in this country, we’ve become members of the family. It’s because of this, we would never want to give the impression we’re somehow unhappy here or feel in any way ungrateful. Nothing could be further from the truth. That in mind, despite keeping ourselves busy with visitors and activities, we found ourselves in a state we hadn’t experienced to this point – homesick, thinking of people and things we missed, longing to reconnect with them. It’s not fun, and it’s not something we wanted to have happen. What you want is to just live in the moment and experience everything fully. This is something that we try desperately to do every day. But it’s hard. And to act like it doesn’t exist lacks authenticity and cheapens the journey we’re on. Yes, even the days we want to go home, it’s all a part of the journey of being here – discovering who we are as individuals, as a married couple, as a family, and as a part of the larger communities that we’re in, both here and abroad. I could go on and on, but I won’t. Suffice it to say, we miss home and at the same time love it here. I know this is a different sort of update than the ones past, but I think it’s good for those of you who are following our progress to see all sides of the journey. It’s one that we wouldn’t change for anything. Maybe it seems these experiences and thoughts aren’t connected, but they’re all a massive part of the “mission” that we’re on. We’re being refined and shaped by the people, by the church, and by the culture we’ve leapt into with both feet. In the end, we want this to become a part of who we are, and the message that we send to the world we find ourselves in…wherever that may be. Until next time. With love.